Tickhill's Steve Reid took five wickets in their win over Aston Hall. High flying Tickhill moved into second place in the South Yorkshire League Championship following a thrilling win over fellow promotion chasers Aston Hall at Alderson Drive. The race for a top three finish - and a place in next season’s new ECB South Yorkshire Premier League - is really starting to heat up and last weekend’s events could yet prove to be pivotal. 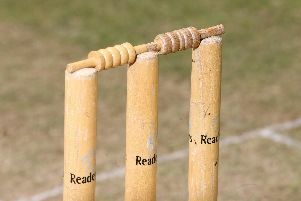 For while fellow promotion chasers Whitley Hall and Treeton slipped to shock defeats, Tickhill held their nerve to defeat fourth placed Aston Hall by seven runs. Tickhill batted first and opener Andrew Rennison was outstanding with an innings of 120. His boundary count was 13 fours and five sixes. Rennison’s fine knock provided the backbone of Tickhill’s total of 231-9 from 50 overs. When Aston batted they were faced with full hostility from impressive Australian paceman Steve Reid, whose parents had flown in to witness his performance. Reid claimed the first three wickets as Aston limped to 43-3 and seemed set for a struggle. However, South African Nicholas Smit (73), supported by Jack Simmonite with 34, set about a rebuilding job. Aston reached 206-5 and victory was within their grasp with 26 runs needed. Wickets then began to fall and the turning point was the run out of Amir Riaz for 52. In the end Aston clung on at 224-9, short by seven runs, as Reid finished with excellent figures of 5-54. Victory, and results elsewhere, left Tickhill just a point adrift of leaders Whitley Hall. Just four points separate the top four sides. n In Division Two Wath B suffered a setback to their promotion ambitions by losing to Sprotbrough. Wath batted first and were all out for 147. Michael Threapleton bowled well to claim 4-30 and Andy Whaley took 3-23. Sprotbrough’s overseas player Scott Semmens opened with an excellent 50 and stumper Tom Kaye contributed 30 as they passed Wath’s score with six wickets to spare. Victory moved Sprotbrough eight points clear of the drop zone. Warmsworth moved to within a point of the automatic promotion places with victory over Elsecar B at Common Lane. Australian Lincoln Jacobs hit an excellent 86, including 13 fours and a six, and youngster Ryan Pearson contributed 40 in Warmsworth’s total of 247 all out. James Fell (60) and Chris Pedler (38) posed the main threat in response but in the end Elsecar had to settle for a point at 217-9. Tom Hyde, with 4-33, proved to be Warmsworth’s best bowler. n Wombwell Main remain top of Division Three East after a 121-run win over Upper Haugh B. Thomas Goldsby–West took 3-19 and Lee Matthews 4-11 to dismiss Upper Haugh for 84.